The 2014 college football season spanned 820 games over 15 weeks, and we covered them all exhaustively. Today we pause before barreling ahead into the bowl schedule to toast the best of the best regular season in sports. Last year, Ray was the anonymous worker bee in Mizzou’s defensive line rotation, toiling in the shadows of a consensus All-American (Michael Sam), an eventual second-round draft pick (Kony Ealy), and even a fellow backup (Markus Golden) who was subsequently heralded as the Next Big Thing entering 2014. This year, Ray surpassed them all, claiming the school’s single-season sack record and the title of SEC Defensive Player of the Year in his first year as a full-timer.1 If his initial draft prospects are any indication, Ray’s first season as a starter will also be his last. In one sense, Mississippi State let a rare, golden opportunity slip through its fingers, failing to win the SEC West or earn a playoff berth despite finding both well within reach in late November; quarterback Dak Prescott wasn’t among the finalists invited to New York for the final bit of Heisman hoopla, either. But the opportunity in and of itself was an unforeseen, unprecedented leap forward: By any measure, the 2014 Bulldogs were the best team in school history, and for one surreal month they reigned as the consensus no. 1 team in the nation. (Previously, MSU had never cracked the top five or ended the regular season in the top 10, where it currently resides at no. 8.) No team has ever ascended from unranked to no. 1 in the AP poll in as little time. Before Prescott, it was impossible to remember the last Mississippi State quarterback who cracked the national consciousness, much less the awards circuit. With one more win in the Orange Bowl, the Bulldogs will clinch their best poll finish ever and a new school record for wins in a season; regardless, 2015 will bring an entirely different set of expectations with Prescott and coach Dan Mullen both expected to return.2 But no one who was along for the ride needs to be reminded of the historical context, or assured of future returns, to file the past three months away as the best of times. For fans who craved delicious, empty calories after their usual bedtimes, the Pac-12 was open late all season long. On September 20, Arizona scored 36 points in the fourth quarter against Cal — 36 in the fourth quarter! — the final six courtesy of a 47-yard Hail Mary3 to win as time expired, 49-45. Two weeks later, Arizona State connected on a 46-yard Hail Mary as time expired4 to cap a wild comeback in a 38-34 win at USC. The same night, Utah beat UCLA, 30-28, when the Bruins missed not one but two attempts at a game-winning field goal as time expired. Later that evening, Cal beat Washington State, 60-59, when the Cougars punctuated one of the most prolific offensive performances in the history of the sport by missing a chip-shot field goal in the dying seconds. The following week, USC beat Arizona, 28-26, after the Wildcats recovered a late onside kick but missed the subsequent field goal attempt. Two weeks after that, Utah beat USC, 24-21, on a game-winning touchdown pass with eight seconds to play. And that was just through October. In November, #Pac12AfterDark delivered the weirdest play of the year, an apparent Utah touchdown that turned into an Oregon touchdown after Utes receiver Kaelin Clay dropped the ball — just casually dropped it, DeSean Jackson–style — before crossing the goal line, allowing the Ducks to take the fumble the other way as Utah celebrated obliviously. The following week, lowly Oregon State upset then–no. 6 Arizona State, 35-27, in one of the biggest stunners of the season. #Pac12AfterDark was college football’s weekly version of The Twilight Zone — if Rod Serling had been replaced by a pair of bewildered announcers who were just as stunned as everyone else. Tennessee played 23 true freshmen this season, most in the nation by far, and 10 of them wound up starting multiple games against a schedule that included Oklahoma, Georgia, Ole Miss, Alabama, and Missouri. (The Vols opened with seven true freshman starters against Mizzou, constituting nearly a third of the lineup.) In Barnett’s case, though, the playing time wasn’t a product of necessity: He was Tennessee’s best edge rusher right out of the gate, surpassing Jadeveon Clowney’s SEC mark for sacks by a freshman with 10 on his way to finishing fourth nationally with 20.5 tackles for loss.5 Opposing coaches noticed, giving Barnett a second-team All-SEC nod, and he seems bound for plenty more recognition in the near future. 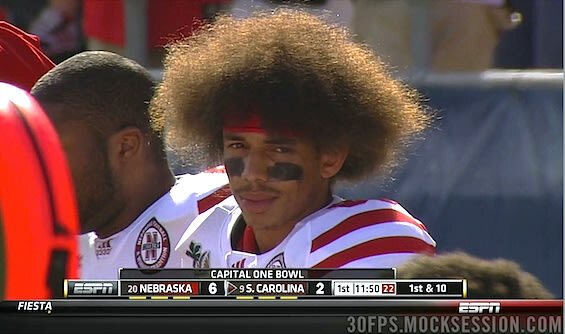 I admit, I didn’t think it was possible to unseat Nebraska wide receiver Kenny Bell, whose gleefully untamed fro had worn the crown for three years running. 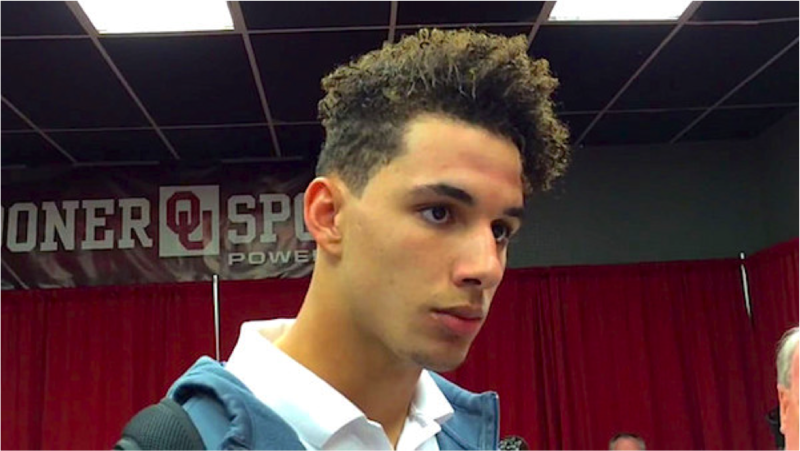 But I didn’t count on two things: One, Bell abruptly shaved his frantic locks before the season, spawning much disappointment across the web, and two, Hurd arrived in Knoxville straight from an All-4-One video circa 1994. Hurd is a big, physical runner with a likely NFL future, and you know his dorm room smells amazing. Luc began his college career as a massively hyped, five-star signee at Florida State but soon found himself on the fast track to the scrap heap: After seeing the field sparingly in his two years in Tallahassee, he opted to bail in 2012 when FSU coaches moved a converted safety ahead of him at strongside linebacker. Luc failed to lock down a starting job in 2013 (after sitting out 2012 because of NCAA transfer restrictions), but as a fifth-year senior in 2014, he was finally able to take up residence at his natural position in the middle, from whence he led the Bearcats in tackles while forcing five fumbles and earning first-team All-AAC honors from league coaches. Rare is the five-star prospect who actually takes five years to earn them all, but Luc is proof that it can be done. This was a banner year for ballyhooed freshman running backs, a wildly productive class that included LSU’s Leonard Fournette, Florida State’s Dalvin Cook, and Oregon’s Royce Freeman, among others. Of that group, Chubb was arguably the least likely to succeed right away, if only because he was joining a depth chart that featured Todd Gurley at the top and another five-star rookie, Sony Michel, competing for the leftover carries. Still, Chubb showed flashes of hard-charging brilliance early on, and when Gurley was temporarily iced by the NCAA, Georgia’s ground game converted to an all-Chubb format without missing a beat: After Gurley’s suspension (and subsequent season-ending knee injury), Chubb averaged 177 yards from scrimmage with 11 touchdowns in the Bulldogs’ last seven games, including a pair of 200-yard outings against Arkansas and Florida and a 192-yard effort against Auburn. Ultimately it was Chubb, not Gurley, who got the All-SEC vote from league coaches and inherited the superhuman expectations for 2015. Pitt always seems to have one insanely good player on an otherwise mind-numbing team destined to finish 6-6 come hell or high water. (The Panthers have won exactly six regular-season games four years in a row, under two6 different head coaches, in two different conferences.) This year, the headliner was supersized sophomore tailback James Conner, who bulldozed his way to 1,675 yards, 24 touchdowns, and a leading role on our Patrick Willis All-Star team. But Conner’s success is also an endorsement for Clemmings, a former starter at defensive end who has rocketed into the first round of mock drafts as a road-grading right tackle. Clemmings is the only offensive lineman on the media’s postseason All-ACC team who wasn’t also on the media’s preseason All-ACC team, a suspiciously good indication he’s also the most deserving. Another indication is that Pitt’s O-line was one of only two fronts (along with Georgia Tech’s) that ranked among the top 10 nationally in all three of Football Outsiders’s advanced statistics for run blocking: Adjusted Line Yards, Opportunity Rate, and Power Success Rate. In 2011, Golson was the hapless freshman posterized not once but twice on a much-replayed, season-defining run by Alabama’s Trent Richardson, which at the time defined Golson and Ole Miss as much as it did Richardson and the championship-bound Crimson Tide. The loss to Bama (by a final score of 52-7) marked the Rebels’ ninth consecutive SEC defeat in a skid that would eventually reach 17 games, costing coach Houston Nutt his job after the 15th. Three years later, Golson was the senior who came down with the spectacular pick that clinched Ole Miss’s 23-17 upset over then–no. 3 Alabama this October, in the same end zone where he’d once been humiliated. Because the Rebels remained undefeated with the win, the decisive play had significant implications at the time for the polls and the nascent playoff race. More importantly, it was the confirmation Ole Miss fans had been waiting for that all traces of their previous futility had been consigned to a forgotten shelf in the attic, to be retrieved only for the sake of comparison with their newfound prosperity. The most memorable, consequential play of the season was also the most miserable for Ole Miss, ever, on multiple levels. In the most immediate, visceral sense, the Rebels lost their most dynamic offensive weapon for the rest of the season when Treadwell was dragged down from behind in the fourth quarter of an eventual 35-31 loss to Auburn on November 1.7 Beyond the ghastly injury, though, Treadwell’s agonized fumble as he barreled toward the end zone also forced officials to erase the apparent go-ahead touchdown after a lengthy review and instead award Auburn what amounted to a game-clinching touchback as Treadwell was still being loaded onto a cart.8 Apart from the Grove itself being consumed by a swarm of pitiless locusts, the home crowd could have hardly scripted a more miserable finish. With that, the most capable Ole Miss outfit in decades was effectively eliminated from the national conversation in historically sadistic fashion, an especially deflating turn for a team that had already beaten Alabama and would go on to derail Mississippi State a few weeks later; only one other team (Oregon) ended the regular season with multiple wins over opponents in the selection committee’s final top 10. A few more inches, and the Rebels might not have been left wondering what could have been. The thing about coach of the year awards is that they’re all effectively limited to overachievers: Who most exceeded expectations, as established by the media before the season? By that standard, the head coach at Ohio State is never going to fare very well, because the expectations in Columbus can’t really be exceeded. The Buckeyes opened the season ranked fifth in the initial AP poll and were favorites to win the Big Ten according to virtually every outlet that ventured a guess. Vegas also liked their chances of landing a spot in the playoff field. But the job Meyer and his offensive coordinator, Tom Herman, have done in the absence of face-of-the-program quarterback Braxton Miller is remarkable. No other coach lost a player as proven and integral to his team’s success as Meyer did when Miller was ruled out for the season in August, and even entitled, demanding Ohio State fans would have had a hard time blaming the coaches if redshirt freshman J.T. Barrett failed to pick up the slack. Instead, Barrett went 11-1 as a starter and finished as one of the most productive, efficient passers in the nation, firmly entrenching himself as the MVP of the Big Ten’s highest-scoring offense. When Barrett went down with a fractured ankle against Michigan, preseason third-stringer Cardale Jones came on to engineer a stunning, 59-0 massacre of Wisconsin in last week’s B1G championship game. (More on that below.) In three years, Meyer’s Buckeyes are 36-3, including 25-1 in conference games, and now appear capable of replacing Heisman-caliber quarterbacks like they’re walk-on gunners on the punt team. Whatever the expectations and whatever the schedule, Ohio State’s consistency and playoffs presence is above and beyond considering the circumstances. Had he remained eligible and healthy beyond midseason, there’s little doubt that Gurley would be in New York this weekend to take his rightful place alongside the crème de la crème, but Gurley’s mystique was never as much about numbers or productivity as the sheer visceral thrill of watching a man his size move with such an amazing combination of grace, velocity, and violence. That hasn’t changed: In some ethereal, cosmic sense, Gurley was the best player in college football this season, even if the objective statistical body of work is lacking. Hopefully, he’ll make it back from the torn ACL that ended his college career at full speed and remain a force at the next level for years to come. If not, someday we’ll be watching nostalgic documentaries about his outrageous potential in the same vein as Bo Jackson and Marcus Dupree. Not to spoil the suspense or anything, but Mariota is going to win the Heisman in a landslide, and he deserves it.9 On paper, this season has been the best in his wildly prolific career at Oregon, and his cause is only furthered by the fact that the Ducks will get the title shot that eluded them in 2012 and 2013. They certainly wouldn’t be prepping for a semifinal date without him. With him, they may be the team to beat. Florida arrived at the Cocktail Party at a low ebb amid rumors that coach Will Muschamp wouldn’t survive the weekend if the Gators suffered a fourth straight loss in the series, and their subsequent ambush had a major ripple effect across the rest of the season: Missouri won the SEC East instead of Georgia, depriving the conference of a winner-take-all championship game between the Bulldogs and the Crimson Tide. In the end, Muschamp was fired anyway, but at least for one glorious afternoon he got to watch his team play big, dumb, Will Muschamp football exactly the way he’d always envisioned it, with previously pedestrian Florida rushers piling up 418 yards rushing on 60 carries against their oldest, most despised rival. Never worked that way before, never worked that way again. But it did work, if just this once. Even in early October, it was obvious this game would endure as the most entertaining game of the season, if nothing else: With 11 minutes to play, TCU led by three touchdowns, 58-37, only to watch Baylor score 24 unanswered points — three consecutive touchdown drives to tie and a field goal drive to win — while using less than five minutes of total game time. (Baylor won with 782 yards of offense, despite committing three turnovers and allowing TCU touchdowns on both defense and special teams.) As the Bears and Frogs kept winning, though, it became increasingly obvious that this game would matter for more than just the excitement, with the final score in Waco serving as a wedge in the playoff wars in frequently ham-fisted fashion. Reasonable people came down on different sides of the great Baylor/TCU debate, but everyone who actually watched the sides go head-to-head can agree that it was a hell of a lot more fun on the field than it ever was in the court of opinion. Now that FSU has mastered the art of the fourth-quarter escape and Notre Dame’s season has collapsed in a heap, it’s easy to forget that their October 18 meeting in Tallahassee felt like the be-all, end-all showdown of the year: The Fighting Irish arrived with a 6-0 record and a no. 5 ranking in the AP poll, making it the only collision of the season between top-five teams that aren’t members of the SEC West. By overcoming a second-half deficit in decidedly non-dominant fashion, the Seminoles reinforced their M.O. for the rest of the year. In pushing the Noles to the brink, Notre Dame used up every last drop in its tank. I waxed rhapsodic about Gordon’s record-breaking, 408-yard romp against the Cornhuskers at the time, comparing the Badgers’ runaway star to a Twitter-era Red Grange destined to span the ages, or whatever ages have been reduced to in Internet years. And I was right: The single-game record lasted exactly one week before it was toppled by Oklahoma’s Samaje Perine against an inferior Kansas defense that had mentally checked out for the holidays. The numbers come and go; the sense of mounting disbelief we experienced watching Gordon repeatedly bound into the open field will never fade. Golden was also a star, finishing with 16 tackles for loss and a second-team All-SEC nod from league coaches despite being slowed by a bad hamstring. Prescott still has to decide on the draft; Mullen still has to resist calls from certain other, more well-heeled schools. Clowney’s record was also broken by Texas A&M freshman Myles Garrett, who finished just ahead of Barnett with 11 sacks. But Garrett was much less active outside of his pass-rushing niche, recording fewer tackles and far fewer TFLs. Technically three, with Keith Patterson handling interim coach duties for one game. Treadwell underwent immediate surgery to repair a leg fracture and hopes to be healthy in time for spring practice. Ole Miss did get the ball back, but with 26 seconds to play and no timeouts, the Rebels never threatened to score. More on the Heisman race on Friday.